I have voiced my opinion about what is fair and what is not fair to beat politicians over the head with this season. One thing has always make my puzzler puzzle though is the following; we could not get a rest from hearing about President Bill Clinton's Mother and Father and Stepfather and how they formed such an important part of making him what he is. Heck, even Senator Hillary Clinton (D-NY) has had the impact of her parents folded into her story. Senator John McCain (D-AZ) could fill up a library with what has been written about his father's line, and his 95 yr old Mom is getting the press after her every chance she gets. There is, however, a rather large gap in Senator Obama's (D-IL) public discussion space about how his Mother, Father, and Stepfather influenced him besides some of his own stuff and bits of fluff . Like I said before, I really don't care all that much about non-issue subjects and believe that this stuff is a distraction for the most part. That being said, it is important to understand the parents in order to get a handle on the prism a person sees the world through. You can't hold a person's parents against them - but it does add context to a persons foundation. My original thought was that there was a gap out of respect for the fact that his parental reference points have all passed on, as we say back home. However ..... maybe the books just haven't been written. When/if they are - all I have to say is based on this from the Asia Times - oh my! Yep, if you were a member of the MSM and wanted to both be invited to the cool parties and keep your job - you may not want to be the one to start writing about this stuff. Use this as background information (note I am not quoting from the article), and I still recommend to stick to the issues - but YIKES! Another recommendation for the Obama campaign. Without sounding defensive and without using all soft-filter and cheese cloth, get this stuff out in the open. Tell the story before someone else does it for you. Heck, maybe it already has been done by Sen. Obama's supporters and it is just hard to find. Most of the stuff out there are about melanin-fetishists like this. About the only substantive review of the Senator's mother is from the Chicago Tribune last March. I think though, that I will just post this video every few weeks. Plenty here, here, and here about the various a55hats at the Oscars and the FOD on their lapels. In contrast to that clueless mob, one thing that may have slipped the collective media mind is the salad bar you see on the right. 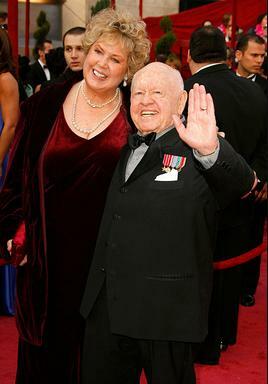 Mickey Rooney ... won the Bronze Star for insisting that his pilot fly him into a combat zone to give the troops a few laughs. 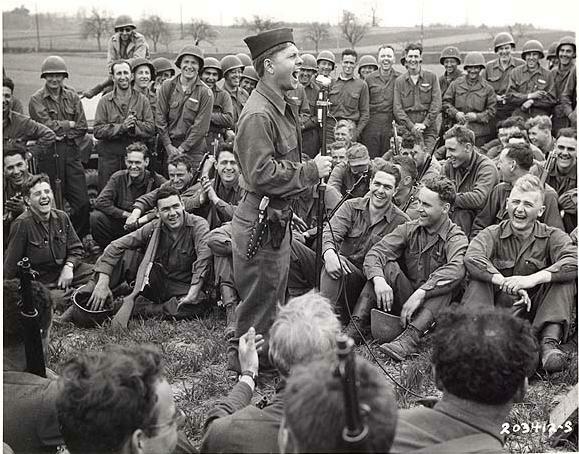 Celebrity draftees like Mickey Rooney entertained troops in stateside training camps, staging areas and overseas units. Soldier "Jeep Shows" and Special Service Company Shows took live entertainment to combat areas. He served, and that Bronze Star was given to him by General George Patton himself. Would love to see that citation, but can't find it. I bet the "insisting" had some choice words that went with it. Would love to hear the whole story. Bronze Star - from General George Patton, USA. That is about as Fullbore as you get. There are details on Mickey in general here. Of all I have found, I like the pic below with the 44th Infantry somewhere in Germany or the Low Countries in his prime - walking the walk like he still does today. The rest of the Orange Ribbon Column should hang their head in shame. Bravo Zulu, Mickey Rooney. Just standing there, you speak with the voice of thunder. BZ, and thanks. 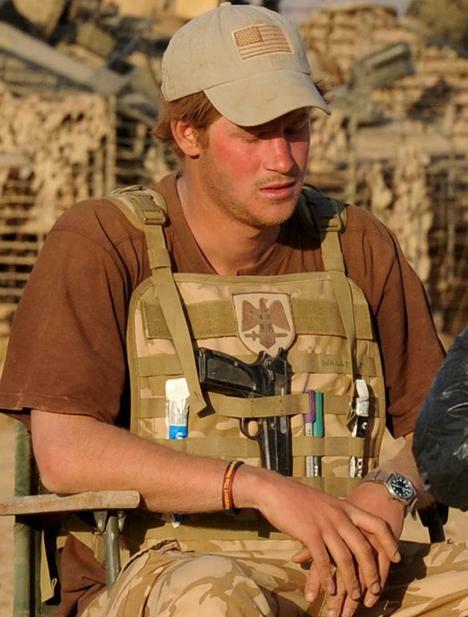 PRINCE HARRY has been secretly fighting the Taliban on the front line in Afghanistan, the Ministry of Defence confirmed today. The 23-year-old Household Cavalry officer has spent the past 10 weeks serving in war-ravaged Helmand Province. But the arrangement broke down today after news was leaked out on the US website the Drudge Report. 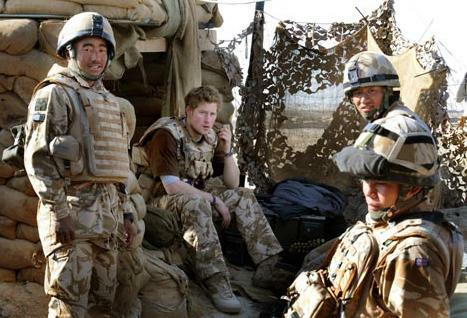 As part of the deal a group of journalists had visited the prince in Helmand on condition that details would only be publicised once he was safely back in the UK. I like the fact that he is in the company of Ghurkas. 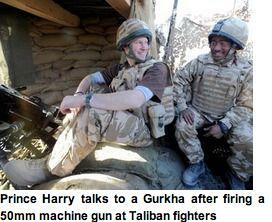 Yep, he was man-for-man in some of the best company a man in combat can be in. Video of the Prince in combat here. UPDATE: Miss Ladybug was nice enough to point out something for us - nice baseball hat! Murtha said he has been talking with Rep. Gene Taylor (D-Miss.) and Rep. Bill Young, (R-Fla.), ranking member of the House Appropriations Committee defense subcommittee, about the possibility of "jumping over [DDG-1000], and going to the nuclear-powered cruiser." 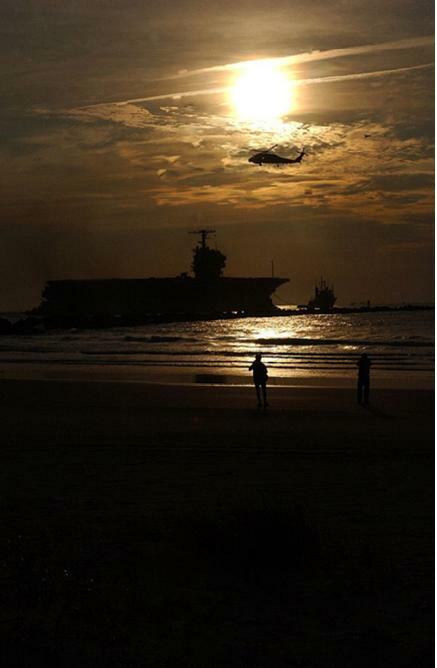 "I know the Navy is looking at that," Murtha noted. Didn't "we" all buy off on the "revolutionary" leap to DD-X/DD-21/DDG-1000 by sacrificing older ships early and not developing a follow-on to the FFG-7 and DDG-51? Did I not get the memo, again? Can you leap so far that you land into nothing but a bottomless pit like the Royal Navy? Are these the best minds we have? Really? I know they have the power, but do you feel even 51% confident in their decision making process? Who is advising these people that? Who is in the Congressional Liaison Office and how do we get them fired and replaced by Galrahn and Chap with Lex taking CAPT McCain's old job? We'll let Skippy work on Pelosi's staff. Nice professional conversation over at Lex's place about the DoD's trial balloon WRT letting CAPT stay longer than they do today. The Navy is “aggressively” working on a plan to keep captains who are not in line for major commands in the service to fill other critical billets. Chief of Naval Personnel Vice Adm. John C. Harvey said Tuesday during testimony before Congress that the fleet… wants officers who have already served 25 years to remain on active-duty. “We are exploring a variety of monetary and non-monetary incentives,” Harvey said in testimony delivered to the House Armed Services Committee’s subcommittee on military personnel at a hearing that focused on recruiting, retention and pay issues. My thoughts that I left in comments was just a top of my list on this subject. Different people have different reasons, but here are two to ponder. 1. Having children in the critical teen-age years, the prospect of moving every 18-24 months gets old after awhile - especially if you can get even-money on the outside in a position where you have geographical stability. 2. 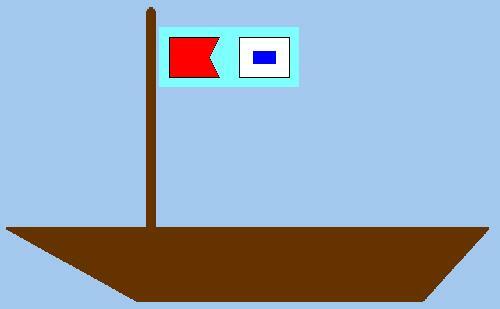 Every time I see a MSC manned ship alongside a warship I think, “That used to be a Major Command opportunity at one time….” When you have Admirals doing CAPT’s jobs and civilians doing CAPT’s jobs, many CAPT are just being better paid CDRs on a Staff filling in another layer in the bureaucratic onion. Doesn’t fit many personalities right. Tough nut. It isn't all about money. It isn't all about location per se. It has a lot about what some consider being a Navy Officer is all about. Sometimes, it is best to wear a suit to do a suit job. Finally, I no longer feel alone. I am just a wee voice out there, but now a major player, nay a Higher Being, is now on to the FOD'd mind of Lawrence Korb. PowerLine is the hunt. I've commented several times on the sophistry of Lawrence Korb, who seems willing to argue anything if he thinks it will advance his anti-war (and anti-Bush) agenda. Here’s another example. Last year, during National Review’s “conservative summit,” Korb debated Bill Kristol on whether “the surge of troops into Iraq is a mistake.” Korb, of course, argued that it was. His thesis, plausible at the time but since disproved, was that the surge would not succeed militarily. One of his arguments was that we had “surged” twice before without success. He thus willfully ignored not only the far more substantial scope of what the Bush administration had decided to do, but also the administration's changes in tactics. A year later, the surge plainly has succeeded from a military standpoint. So now Korb argues in a recent debate with Ralph Peters that we’ve had that success only because we’ve made a deal with the Sunnis without insisting that they pledge their loyalty to the government. Korb adds that we could have had that deal two years ago if we wanted it. But I thought the surge was destined to fail because it was simply a repeat of what we had tried unsuccessfully in the past. In the same debate, Korb claims that, as a result of the surge, we increased our troop levels in Iraq by 50,000 troops to 180,000. The prior efforts that Korb alluded to at the NRO summit do not involve anything of comparable scale. So again, his argument that the surge had already been tried was bogus. 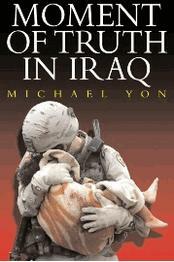 The Iraq war is an issue about which people of good faith continue to disagree. Lawrence Korb isn’t one of them. I bet Byron has a few words on the USS FORRESTAL (CV-59). The Navy’s fleet of inactive ships has been reduced by more than two-thirds in the last decade, the plan notes. An inventory of 195 ships in 1997 is now down to 62 ships, the document says. These ships will be disposed of by sinking in the listed fiscal years. * 2009: destroyer tender Acadia, destroyer Conolly, both no longer in service, and research ship Hayes. * 2010: combat store ships Concord, San Jose, Spica and Niagara Falls. * 2011: combat store ship Saturn and ammunition ship Kilauea. * 2012: ammunition ships Flint, Shasta, Mount Baker and Kiska. The decommissioned auxiliary aircraft landing training ship — and former carrier — Forrestal and destroyer Arthur W. Radford also are expected to be sunk, but no time frame has been determined. Have you been to gCaptain yet? Well, before you head on over - make sure your in-basket is empty. Casey said he had "no reason to doubt what it is the captain says." "We acknowledged and we all worked together to correct the deficiencies with equipment that we saw during that period, not only Afghanistan but in Iraq," he said in response to the question posed by Republican Sen. Lindsay Graham, a longtime supporter of GOP presidential candidate Sen. John McCain. 4. That the brass thinks Obama is going to win and has decided not to jerk him around too much. Do these people ever actually talk to real people in the military. Is that what they think our thought processes are? ...sounds like standard issue equipment challenges I experienced during Gulf War I, DESERT FOX and the post 911 deployments. That wasn't Bush 41's, Clinton, or Bush 43's fault. That is fighting wars supplied by the lowest bidder. Being an MP, I had to get a crash course in 18B. And I did. The part they don't tell you about before you get in country, is the Afghan Supply system. And that was a system based upon shortages. The warlord system of supply is not quite worked out of the Afghan military. Their supply system is horribly bureaucratic and is not geared toward supplying the companies, but in demonstrating who has the power ("I have the stuff, therefore I have the power") They are still working that out, with our assistance. As a result, we did scrounge RPG-7 rounds, 82mm Mortar rounds, and rifle ammunition from any caches that we hit, knowing that we could wait for months to be re-supplied otherwise. 1. There were no shortages of anything "American" that I needed to fight the battle. So, I guess all of us "think(s) Obama is going to win and has decided not to jerk him around too much." I think you just told us a lot more about the way you think than anything else. Some have issues that Obama implied that he talked to the Cpt about this subject, which he did not. He also did not make it clear that he was talking about events of 4-5 years ago. He also implied that the US military has to scrounge the battlefield to fight the Taliban. The last bit is really the core of the problem. On that and the fact Obama did not talk to the Cpt about this and that the Cpt never claimed that they had to scrounge for weapons is the issue. I've heard from an Army captain .... They were actually capturing Taliban weapons, because it was easier to get Taliban weapons than it was for them to get properly equipped by our current commander in chief. The Captain has spoken to Sen. Obama, he says, but this anecdote was relayed to Obama through an Obama staffer. Someone who now has or may one day have a DD-214 and isn't trying to get a job on the Obama team please become these peoples friends. You might be able to find them at Pilates class or something. His magazine is what in a large measure brought me from Left to right. My prayers are with his family and friends - but we should all remember he had an outstanding, well rounded, thoroughly important life with a great family that made us all better by his presence. A bipartisan House panel is nudging the Pentagon to begin a conversation on how to reform itself in many ways. But at the Pentagon, talk of change usually has a budgetary impact. And, despite the past several years of "nation-building" and counterinsurgency operations in Iraq and Afghanistan, there has been virtually no change in the way the defense budget is carved up in at least 40 years, says Rep. Jim Cooper (D) of Tennessee, who chairs the panel. "That right there is a statistical indictment of the process," Representative Cooper says. "There had to be a year in which there were greater needs in one area or another, and the system was unable to accommodate it." The fiscal 2009 budget request released this month, for example, shows the Army requesting a 27 percent share, the Air Force asking for a 28 percent share, and the Navy, which includes the Marine Corps, wanting a 29 percent share of the proposed $515 billion budget. Cooper's seven-member panel is expected to release a study this week on each of the branches' "roles and missions" that may threaten services that are seen to perform more conventional warfare. With the focus on the ground wars in Iraq and Afghanistan, that makes some in the Navy and Air Force worry. Smaller USN piece of the whole DoD pie - with a growing % of the USN represented by USMC needs? The math is tough PEO Ships; where are the affordable hulls? Congress is asking the same questions that many in and out of uniform have raised for some time. "After seven years of war, that we haven't budged one inch away from the cold war apportionment of the budget to me is Kafka-esque," said Robert Scales Jr., a retired Army major general, speaking last week at a think tank. "I just can't explain it. I don't understand." Scales is right. The next quote is right from the "If you can't dazzle them with brilliance..."
The wars in Iraq and Afghanistan have emphasized the need for ground troops, leading to focus on the Army and Marine Corps. Meanwhile, while the Navy and Air Force both contribute much to operations overseas, they are seen as virtual "silent partners." That has forced both services to step up their marketing efforts. The Navy is holding events it calls "Conversations with the Country" in an effort to call attention to its new maritime strategy, which focuses on fighting terrorism in untraditional ways. And the Air Force on Sunday launched a new ad campaign to highlight the allure of the nation's air superiority, employing a marketing theme titled "Above All." Basically, I got pi55ed off, turned off, and decoupled. If you click the label at the bottom, it all started with a (still) incomplete review of the old Maritime Strategy, but with the launching of the new MARSTRAT, it shifted to discussion of the new. Well, the new MARSTRAT sat with me like a spoonful of unsalted, unbuttered, unpeppered grits. The lame cop-out reviews like those of former SECNAV John Lehman in NOV07's Proceedings didn't help my mood much - just added to my desire to spit it out. I think, based on conversations and some other reviews starting to move forward that the inadequacy of the new MARSTRAT has started to fester among others. It has moved from a benign mass in the Navy body to an engorged, oozing pustule that demands attention. I'm thinking about bringing back Maritime Strategy Monday. Maybe not every Monday, but now and then when the right topic comes up. In any event, there are some good MARSTRAT works out there that might be worth out efforts and time. Galrahn is thinking about it over at his place as well - and I don't think there is a better place to get a critical mass of professionals talking about it. If you haven't shaken the hand of a Canadian in the last year and told them how proud you are of their Nation and their military, then shame on you. Canada is a great friend and though they are not quite at the same level as we are (mostly due to a culture of UN type operations, 20 years of bare-boned defense budgets, and a Left elite that hates anything that smacks of their brothers south of the Great Lakes), but they have turned-to and are fighting for the West better than any of our Allies outside the mother we share, Britain. Though the minority Tory government of PM Harper just received the support from the Center-Left Liberals, Canada is close to leaving Afghanistan because the help they thought their Continental Allies would provide in the South has not been coming. Due in a large part to the new, mature view in Sarkozy's France, there may be a new way to help. Being that the rest of NATO refuses to Cowboy-up, two articles here and here outline a little Franco-American shuffle that will fill the gap in addition to the 3,200+ USMC coming to the South and West this spring. France may send hundreds of ground troops to eastern Afghanistan, where NATO-led forces are fighting insurgents backed by Al Qaeda, Le Monde reported Tuesday. It said the move would be part of a new Afghan policy being worked out by President Nicolas Sarkozy and his advisers. France has about 1,900 soldiers under NATO’s Afghan command, most of them based in relatively calm Kabul, and Le Monde said the fresh troops would be deployed outside the capital. “Their destination would be zones of potentially fierce fighting, preferably the eastern region of Afghanistan close to the tribal areas of Pakistan,” it said. Early last year, France withdrew 200 special forces soldiers who had been operating under United States command in Afghanistan, but Le Monde said France was now expected to sanction the return of the special forces. About 50 remained to train Afghan commandos. Under the plan, the deployment of French soldiers to the east would free United States forces there to help Canadian troops fighting insurgents in the south. BZ to France. Let's watch and see, but with France moving forward and Canada standing-fast, NATO might just do the right thing at the last minute. Maybe not .. but it does sound familiar. McCain knows to beat Obama he has to attack his Center of Gravity via his Critical Vulnerabilities. Obama is most vulnerable on his record, what little there is. If you play school-yard name games, you are being distracted and creating Undesirable Effects in favor of Obama. Fact. Get you game face on; McCain does. I think Hillary finally has figured out what many already saw over the last month. First of all, the fact that right of center run screaming for the Holy Water whenever she comes on the TV is well known. What is not well known, and on one had the stones to brief Hillary on this - is that on the left of center she was not liked either; but supported due mostly to fear, respect for her ability to wield power a against those who didn't support her, and mostly a desire for a return to Executive power by the Left both in the Democrat Party and the fellow travelers in the Press. Last night you saw that the left of center and the media now know that they have a chance to do exactly what the right of center wants to do; move beyond the Era of Clinton. In Sen. Obama they see a chance to do exactly that, and perhaps get the Executive Power they once thought only Hillary could deliver. My support for McCain is well known. My beef with Obama is all policy. From the War to guns and most everything in between, we are on opposite ends. My beef with Clinton is much deeper and best only discussed on a STU. All that is left for Hillary is the voting in OH and TX. Never count a Clinton out - but I think she is way past "stick a fork in her." The below videos, especially the first one, via NRO should make that clear. Ditch three-time "Wall of Shame" awardee retired USAF Gen. McPeak .... like, yesterday. (Hint, check out the "Wall of Shame" on the right side of the blog). He has almost no credibility in the rank-and-file military. In the USAF he is mostly know as the man that wanted everyone to look like wandering ghosts from Eastern Airlines. I mean, look at it! Anyway, let's see what he has to say that is so bad for the Obama campaign. "Any military person who concludes he's a left-wing, hair-on-fire, Kumbaya child of the '60s has sadly misunderestimated him, to use George Bush's term," said retired Gen. Merrill McPeak. Gen. McPeak, who is an Obama campaign co-chairman, said the senator's intelligence will dazzle the Joint Chiefs of Staff. "I think Obama is going to be an outstanding commander in chief, not just an ordinary commander in chief," he told The Washington Times. "He has the potential to be one of the all-time greats. I think the senior military will learn that about him starting from the first minute he occupies the Oval Office. ... There's no question that he is kind of scary smart. I think just plain intelligence is a very good quality to have in a commander in chief." "I think Obama would be very good." Mr. Korb said. "I think the job of the commander in chief is to listen to all of the inputs he gets and then have a sense of world history and the way the world works, and to be able to apply the advice he gets from his military people. Remember, Obama was one of the first ones to support a larger military, a larger Army and Marine Corps, well before the administration did." There are some good, honest, solid and smart men of the Left out there for defense issues. These aren't two of them. An exceptionally important article in today's Washington Post that, unintentionally, shows what an exceptionally clueless moment Sen. Obama (D-IL) had last week WRT Afghanistan. With a focus on the efforts of the Dutch in the literal South Central province of Uruzgan, specifically the Deh Rawood district, it gives clear insight into the problems the NATO forces are having Tactially and Operationally with a flawed and outdated NATO Strategic Plan to deal with the Taliban. The USMC "one time" gap fill due to NATO's poor resourcing and the inability to reinforce the Canadian, Dutch and British in the South is the real AFG conversation we should be having this election. Lt. Col. Wilfred Rietdijk, a 6-foot-7 blond Dutchman, took command of his military's reconstruction team in the southern Afghan district of Deh Rawood in September. Tranquil and welcoming, it seemed like the perfect place for the Netherlands' mission to help rebuild this country. "We could go out on foot," Rietdijk said. But the day after Rietdijk arrived in Afghanistan, his field officers reported hundreds of villagers suddenly fleeing parts of Deh Rawood. "Within a few weeks, everybody was gone," Rietdijk said. "We didn't understand why." Now the Dutch say they realize what happened. Even as the soldiers believed they had won the support of the local population, the Taliban had secretly returned to reclaim Deh Rawood, home district of the group's revered leader, Mohammad Omar. It took only a few months for the Taliban to undermine nearly six years of intelligence work by U.S. forces and almost two years of goodwill efforts by Dutch soldiers. In the year and a half since NATO took over southern Afghanistan from U.S. forces, its mission has changed dramatically. Dispatched to the region to maintain newly restored order and help local Afghans reconstruct their shattered communities, Dutch and other troops from the alliance now find themselves on the front lines of a renewed fight with a more cunning and aggressive Taliban. More foreign soldiers and Afghan civilians died in Taliban-related fighting last year than in any year since U.S. and coalition forces ousted the extremist Islamic militia, which ruled most of the country, in 2001. Military officials here expect the coming year to be just as deadly, if not more so, as the Taliban becomes more adept militarily and more formidable in its deployment of suicide bombers and roadside explosives. It is a good strategy only if you get enough military strength to create a aafe and secure environment. That is the failure. Uruzgan Gov. Assadullah Hamdam....has heard the Dutch say dozens of times that it is up to him and his security team to provide security for his people. He shook his head. 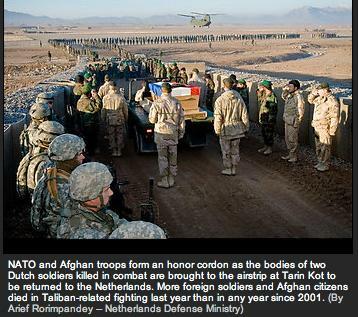 He knows the Dutch are committed to remain in Afghanistan only another 2 1/2 years. He now has just over 1,300 police officers; his police chief says they need 3,000. "There's not enough force," Hamdam said. "The police are not strong enough, and we can't depend on the Afghan army. The police can't go alone without the coalition forces. "If they were not here," he said, "who knows what would happen." Though I wish the Dutch would stay to see the job done, I won't fault them too much. They were on the bleeding edge of the Continental NATO nations trying to do their duty. Their neighbors failed them. A nation of only about 17 million, The Netherlands has done more than the much larger France and Germnay. She tried, but it looks more and more like the non-English speaking NATO failed to live up. Sure, a thousand plus Poles (pop. ~35 million), a few hundred Danes (pop. ~5 million) and Estonians (pop. LT 2 million) are nice - but without the French (pop. ~60 million), German (pop. ~82 million), or Turk (pop. ~71 million) trigger pullers - this will turn into a mostly US operation once again down the road as the Dutch, Canadian and perhaps others head for the door. Tomorrow or later this week we'll look at Canada. A float featuring effigies of US Democratic presidential candidates, New York Senator Hillary Clinton and Illinois Senator Barack Obama makes its way through the streets during the "Rose Monday" carnival parade in the western German city of Duesseldorf. Yep, they about got it right. ...can hit any of us at any time. I noticed in the comments that many of you have already left a note - but for everyone else; one of those bolts out of the blue hit a long term member of the Fat-chewers and good friend to this blog, Skippy-san. If you get a chance, if you are not in a position to buy him a beer anytime soon - head on over and give his shoulder a squeeze. OK Republican types .... let's not do what the Clinton team is doing. - Obama is not a Moooslim. He is a Christian, so that actually makes him, according to Islamic Law, an apostate from Islam. Good. An example to tell all. He has questionable relatives in Kenya - but hey, I don't want people judging me by some of my cousins either. - Leave the wife alone. Nuff said. - I don't care what he wrote in Kindergarten or the wife wrote in her early 20s in college after soaking in mid-80s collegiate racial politics. Don't care. Just don't care. To get more, check out this convergence - Stephen, Allah, and Michelle are roughly on the same sheet of music. Pound all day on Obama's goofy Leftist polics - but leave the gutter cr@p to Clinton and the NYT. Take charge and carry out the play of the day. I don't think Sen. Obama will be quoting this source from Afghanistan anytime soon. Thanks to Matt Sanchez for bringing this primary source that - hey - is a 2008 reality, to the front. I spoke with a buddy of mine, Army Sgt. Anthony McGee, currently stationed in Gardez, Afghanistan. I last saw Sgt. McGee, a former Marine, in November. Anthony had these comments that I have reprinted with the Sergeant's permission. 8:49 AM me: Have you heard of shortages elsewhere? If you like the cut of SSG McGee's jib, head on over to Matt's place to see a short video of the SSG doing that do that he does so well. Riverine: what is the attraction? As usual, it takes a Chief to make it all clear and to the point. For many sailors who had spent years in various billets at sea, the chance to start a new command was irresistible. 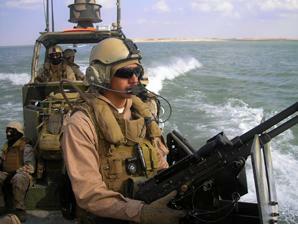 "The fast boats and the guns," said Pat Gehrke, lead chief petty officer for Werby's squad. Nice little bit, though thin of details, in the LA Times on the second Riverine deployment. Yep, this put a smile on my face. Conservative radio talk show hosts who had long reviled Mr. McCain, the Republican presidential candidate from Arizona, had rallied to his defense. Bloggers on the right said that this could be the start of a new relationship. Most telling, Mr. McCain’s campaign announced Friday afternoon that it had just recorded its single-best 24 hours in online fund-raising, although it declined to provide numbers. Hey, even 'ole Phib sent some cash to Sen. McCain last week. What have you done? Since shortly after I started this blog (even before he became Mr. Biggy-pants), CDR Salamander has been a supporter, reader, and fan of Michael Yon. If you have not thrown anything in his tip-jar, but have enjoyed the work he has done, then I recommend you pile on here and pre-order his book coming out in April. Regular readers should recognize the picture on the cover. Yes you should. Don't disrupt my willful ignorance!!! Some attitudes, like those form your average NPR listener, are universal. From Radio Netherlands; Hans de Vreij - BEHOLD! Has Dutch public broadcaster NOS allowed itself to be used as a tool of the 'communications policy' of the country's defence ministry, or was the video material provided by the ministry simply too interesting for the broadcasting organisation to ignore? Whatever the answer may be, the fact is that public broadcasting's prime-time 8 o'clock news on Wednesday evening was to a large extent filled with footage of Dutch and Afghan troops engaged in real combat with what appear to have been Taliban fighters in the southern Afghan province of Uruzgan. A further - and not insignificant - detail regarding this material: it was actually shot in August of this year. Surprise and consternation were prominent among the reactions to the video footage of a prolonged battle, which took place close to the Afghan village of Chora in Uruzgan province. But the reasons for the surprise and consternation were extremely varied. Never before have such detailed images been shown of real fighting involving Dutch forces in Afghanistan. It's no secret that such fighting does indeed take place in that country, for the Dutch defence ministry's website publishes a weekly summary of the troops' activities. When fighting or attacks have taken place, that is all duly listed. Such incidents are in most cases also reported at an earlier stage by means of individual press releases. He is trying so hard to blame one of the world's most open governments for his own ignorance by bringing the truth to their taxpayers. The video he is talking about is here. (BTW, about 2/3 of the way through, you will see the joy that an A-10 can bring to the infantry - and it sounds great in the sub-woofer). Hans, read; either that or watch 09:11 Zulu. UPDATE: Hans weighs in via the comments and fleshed out his argument and purpose for the article. Worth the read in that it will help you gain some appreciation from the Dutch point of view - but read it a few times - as from an American perspective it can be difficult to get your head around. Where as we live in a Pentagon Channel and Bloggers Roundtable environment with the likes of Totten, Yon, and Sanchez a regular part of the Long War diet - the Dutch just don't have it. In spite of the fact that the Dutch military, both on the ground and in the air, are fighting just as much as the US, Canadian, UK, Danish, Estonian colleagues in the South of Afghanistan, the Dutch ruling elite do not encourage the well rounded knowledge base that Americans would consider the norm. So, perhaps in reflection "willful ignorance" in the title is best not read as pointed at Hans - as in much of his body of work (for example this article from APR of '07, he is trying to do his part). A better title might be, "Yikes!!! Don't show the truth, I am still trying to keep the Dutch people as ignorant as possible!!!" directed at the Dutch ruling elite. Then again, if the Dutch people demanded more information about what their soldiers and airmen are doing (...and they have much to be proud of...), then maybe this NOS video would not have the shock that it had. Thank you Mr. de Vreij for showing up and filling in the gaps. I tilt my Stroopwafle at you - and if you have an article you have written in the last six months or so that might flesh out the Dutch perspective in planning to leave Afghanistan in '10, I would enjoy the chance to share it with my readers. Dank u! OBAMA: You know, I've heard from an Army captain who was the head of a rifle platoon -- supposed to have 39 men in a rifle platoon. Ended up being sent to Afghanistan with 24 because 15 of those soldiers had been sent to Iraq. Name please. OK - just his unit. Then again, I think finding that guy would be like trying to find Brian's Canadian girlfriend. O'kie-DOH'kie. That is why I wear this too, Senator. The Navy Exchange almost never has a size 7-3/8 pis......I mean garrison cap. UPDATE: Tapper has more information on the "Captain," though we don't have any more specific information on him. 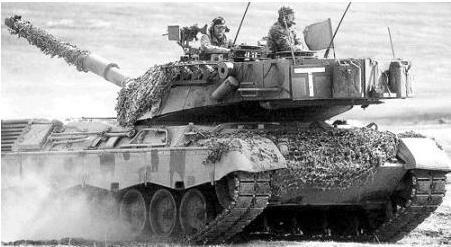 ...sounds like standard issue equipment challenges I experienced during Gulf War I, DESERT FOX and the post 911 deployments. That wasn't Bush 41's, Clinton, or Bush 43's fault. That is fighting wars supplied by the lowest bidder. Comes with the work permit. Sooooo ... if you challenge Obama's half-cocked misuse of a poorly researched and incorrectly referenced story during the debate you don't "...actually care about the men and women who are bravely serving our country ...", well Jake - kiss my a55. Stop spinning for the Obama team Jake, if you actually care about the men and women bravely serving our country at home and abroad. Oh, and again, kiss my a55. Don't you dare imply anything about my motives about who I serve with. UPDATE II: Electric Boogaloo. Via and email to a blog-buddie, I shared a couple of things with him I though would be good for all. If, unlike Tapper, you are interested on the real challenges in Afghanistan, there are two reports that came out this month and represent some of the best open source information available on Afghanistan. I don't agree with all the commentary in them, but they are both very accurate and mostly spot on. I give it a 90%+ rating. First the International Crisis Group report that came out 06 FEB of this year. George Soros is on the Executive Committee, so you know it isn't a right-wing flunky think tank. Secondly, try the SENLIS report from this month as well. There are lots of things about AFG and South Asia in general that are worth Sen. Obama's time - this tired AFG vs IRQ is very 2006, stale, not that accurate - and not worth the political capital. 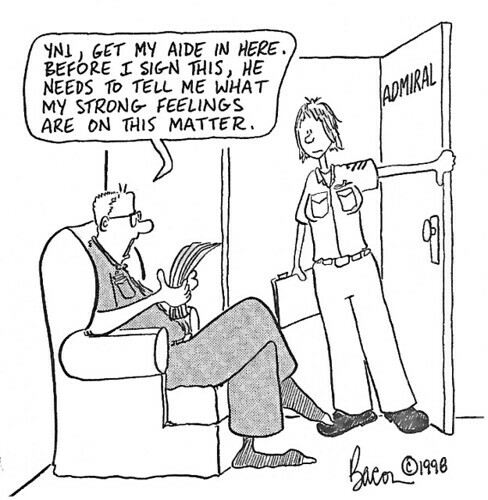 What I need from you are the essential facts of when — the dates — the unit was deployed, to which brigade combat team, or other unit it was assigned, the name and current location of the captain, or other military personnel who shared the alleged facts with you, so that committee staff can debrief them. Flopping Aces has some solid comments, more from HotAir, BLACKFIVE, the Pentagon is roll'n its eyes as well. Ace, of course, has managed to find the Captain (well, a Captain) in question, in the hills, facing a dangerous and primitive enemy, without the weapons he needs. Hey Lex, at least I beat the Army dude. 58 out of 60 correctly — 96.67 % on the Intercollegiate Studies Institute Civics Quiz. Big fun, give it a try. I need to brush up on St. Augustine of Hippo and central banking - I guess. Discipline. Honor. Sacrifice - and steadfast leadership. Do you really know what they mean? How do you know you, as well as the men and women under your command, can do what is needed - and do it with cold firmness? Are you ready for the Birkenhead Drill? An’ they done it, the Jollies—’Er Majesty’s Jollies—soldier an’ sailor too! So they stood an’ was still to the Birken’ead drill,2 soldier an’ sailor too! A little bit from Kiplings "Soldier an' Sailor too!" Here is the background. At 2 a.m. the following morning, the Birkenhead struck an uncharted rock at 34°38′42″S 19°17′9″E﻿ / ﻿-34.645, 19.28583﻿ near Danger Point (today near Gansbaai, Western Cape). The barely submerged rock is clearly visible in rough seas, however it is not immediately apparent in calmer conditions. The initial impact ripped open the forward watertight compartment between the engine room and the fore peak, immediately flooding it and drowning over 100 soldiers in their hammocks. A second impact ripped open the bilge in the engine room, resulting in the two largest watertight compartments in the vessel being been flooded. The surviving officers and men assembled on deck, where Lieutenant-Colonel Seton of the 74th Regiment of Foot took charge of all military personnel and stressed the necessity of maintaining order and discipline to his officers. Almost everybody kept silent, indeed nothing was heard, but the kicking of the horses and the orders of Salmon, all given in a clear firm voice. Distress rockets were fired, but there was no assistance available. Sixty men were detailed to man the chain pumps, sixty more were assigned to the tackles of the lifeboats, while the rest were assembled on the poop deck, in order to raise the forward part of the ship. 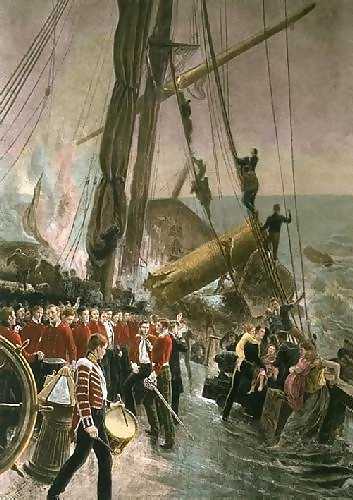 Poor maintenance and paint on the winches resulted in only a few of the ship's lifeboats being launched, and the two large boats, with capacities of 150 men each, were not among them. Eventually two cutters and a gig were launched, onto which all the women and children were placed and rowed away for safety. Only then did Captain Salmond order that those men who could swim should save themselves by swimming to the boats; Lt-Col Seton, however, recognizing that rushing the lifeboats would risk swamping them and endangering the women and children, ordered the men to stand fast. The cavalry horses were freed and driven into the sea in the hope that they might be able to swim ashore. The soldiers did not move, even as the ship broke up barely twenty minutes after striking the rock. FYI, that is where the phrase "women and children first" originated. Hat tip CO-ED Combat . Hey, everyone is allowed to take what ever position they want on anything, and all political sides need smart military experience helping them make the right decisions for the Nation. Therefore, no harm no foul for Nagl - however - I only think it is fair to give everyone proper Indications & Warnings about the why/what is behind Nagl, a Army superstar, plans to do when he punches out at 20. Nothing wrong with punching out at 20 - just a shame and as you will see below - not without reason, methinks. Ever hear of the Center for a New American Security? Didn't think so. That is where he is headed once he finished TAP class and all. Heck, he is there right now - I think he should have waited until after he left Active Duty before going over to such an obviously partisan organization. Yes, partisan - and not what you might think. So, you ask - who is in the CNAS? ---- And SECDEF for the first part of the Clinton Admin. ---- And was SECSTATE for the second part of the Clinton Admin. ---- Who after he let other's hang out to dry for the scandal he caused has no place on the right left to go. ---- And a multi-culti Diversity Bully. ---- Under SECDEF (Comptroller) for Clinton. The Honorable Dr. Leo S. Mackay, Jr.
---- One of the Revolting Generals. ---- Chief of Staff for President Clinton. I will let you do your own work on the Board of Advisors, if you want. One note though, note in addition to Armitage Actual above, there is another Armitage connection below. Armitage, in addition to having classic wannabe SEAL-lust, is a stalking horse for Colin Powell. Hint, hint. Yes, the CNAS is a Democrat holding pen. It even has ole Nate Fick, who has made me sad since he started hanging out with Wall of Shame founder Wesley Clark and other lost souls at the Lefty IAVA. USS Lake Erie (CG-70); when you care enough to send the very best. Gold Star mother of AO2 Marc Alan Lee, USN - the first SEAL killed in Iraq - schools the Berkeley City Council. My own words do not do this justice. ...errrrrr....that would be "Jack," AKA John S. McCain IV, otherwise known as MIDN McCain to you and me. 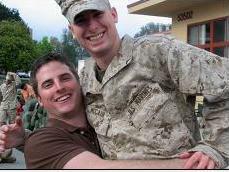 That is him on the right giving his brother Jimmy a big brotherly hug before he heads out, as an Enlisted Marine, to a deployment to Iraq. I think it all speaks for itself, but head on over to GoMids for the interview. So, it started. As you would expect, like some 4 year Kubuki dance, all the appropriate journalists who write for the appropriate publications are making the appropriate noises about and against whoever is the Republican candidate is. Nicholas D. Kristof's work on Africa is great - he should stick to that. This pathetic hit piece on Sen. McCain (R-AZ) is just, well, pathetic. Even for those of us who shudder at many of John McCain’s positions, there is something refreshing about a man who wins so many votes despite a major political shortcoming: he is abysmal at pandering. ...Mr. McCain truly has principles that he bends or breaks out of desperation and with distaste. That’s preferable to politicians who are congenital invertebrates. I disagree with Mr. McCain on Iraq, taxes, abortion and almost every other major issue. He has a nasty temper, which isn’t ideal for the hand holding a nuclear trigger. For a man running partly on biography, he treated his first wife, Carol, poorly. And one of the meanest put-downs in modern political history was a savage joke that Mr. McCain publicly related about Chelsea Clinton when she was 18 years old; it was inexcusable. Yet Mr. McCain himself would probably acknowledge every one of these flaws, and he is a rare politician with the courage not just to follow the crowd but also to lead it. It is refreshing to see that courage rewarded by voters. It is almost as if Kristof felt guilty that he had to smear mud on McCain - like he was forced to. I disagree with Mr. McCain on Iraq, taxes, abortion and almost every other major issue. - Pro- un-Constitutional Judicial activism. - Loves the present immigration system (sic). Now, who does get McCain? Christopher Buckley, for one. And yet the sum of Mr. McCain seems (to me, anyway) far greater than the parts. How many elections offer such an inspired biography as his? And who among “us” — with the exception of Senator Thad Cochran of Mississippi, who issued a statement saying that the thought of Mr. McCain in the Oval Office sent “chills up my spine” — would not sleep soundly knowing that the war hero was on the job calculating how to dispatch more Islamic fanatics to their rendezvous with 72 virgins, without an interlude of waterboarding, while in his spare time vetoing Senator Cochran’s latest earmark. Mr. McCain’s speech at that big-O Overwrought conservative conference was a model of — I’m glancing at my New Yorker cartoon — mollification. I’d love to have been inside his brain — or to have had a mind-reading crawl run across the bottom of the TV screen — as he was offering his emollient words. I’m guessing it was something along the lines of, “All right, you blinking, high-maintenance idjits, if this is what it takes, I’m willing to do it, but honestly I’d rather be doing vodka shots with Hillary Clinton.” But then defiance — defiance of the gleeful kind — is a quality I’ve always associated with conservatism. Islam (Hechem, one issue) on the way out? How are your buddies doing Joe?